Endodontic therapy: Endodontic therapy is a procedure to retain a tooth that may otherwise require extraction. it results in the removal of the pulp tissue (nerves and blood vessels) from the inside of the tooth then seals the space with a filling material. Endodontic therapy enjoys a high degree of success, but because it is a biologic procedure, success cannot be guaranteed or warranted. Occasionally, a tooth, which has had endodontic treatment may require retreatment, periradicular surgery or even extraction. an extensive preparation (drilling) of the tooth. The extensivepreparation may have been done to prepare the tooth for a crown (cap) or other large preparation for a restoration. treated with endodontic therapy on the tooth. This routine procedure can save the tooth and enable you to avoid the harmful effects of tooth loss. It is successful in more than 90% of the teeth in which the treatment is completed. Endodontic treatment can take from one to three appointments to complete. Teeth can have one to four canals that need to be treated. An opening is created to access the nerve, and the abscessed nerve is removed from the root or roots. The canals where the nerves had been located are then cleaned and shaped and a medication may be placed in the canal to promote better healing. When it has been determined that the canals are free of infection, they are filled with a special rubber-like material and sealed with a cementing medium. 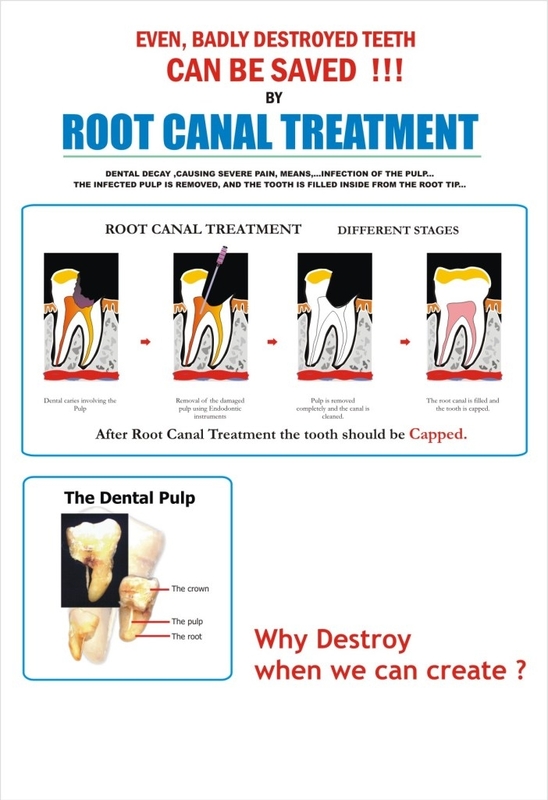 The abscessed area associated with the tooth will then begin to heal.. Once the endodontic therapy has been completed, the tooth is usually restored with a cast crown or onlay. This is done to protect the tooth and prevent it from fracturing. Please note that this infection may cause discomfort between root canal appointments. This is normal and usually not a cause for any concern. Contact the office if there is pain and/or swelling. Remember to avoid biting down on the tooth until the root canal is completed and the final restoration has been placed. You may have had no discomfort from the tooth prior to the root canal treatment or have been unaware that you even had an abscess. 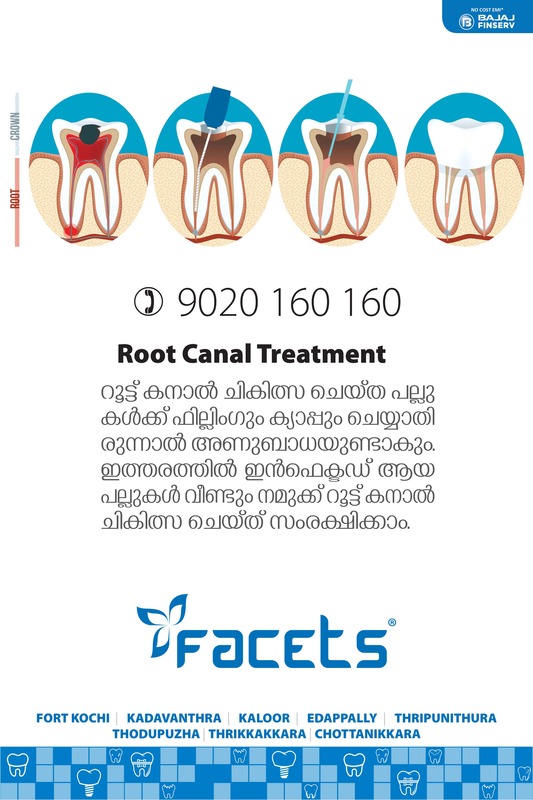 However, you may experience pain or swelling after the root canal treatment has begun. may include swelling, pain, trismus (restricted jaw opening), infection, bleeding, sinus involvement and numbness of the lip, gum or tongue, which rarely is protracted and even more rarely permanent. Swelling, skin discoloration and pain requiring use of medication can occur with any surgery and vary from patient to patient and from one procedure to another. During surgery your mouth will remain open for an extended period of time. Afterwards, you may experience pain and discomfort in your jaw joint. Trismus is limited opening of the jaw due to inflammation and/or swelling. Infection is possible with any surgical procedure and may require further surgery and/or medications if it does occur. Slight bleeding is usual for most surgeries and can be controlled. Significant bleeding can occur during or after surgery, but it is not common.